Nice Weather Days por Lemuria Software Development, Inc.
Por Lemuria Software Development, Inc.
Nice Weather Days helps you to find those perfect days that are worth using your precious vacation days for! 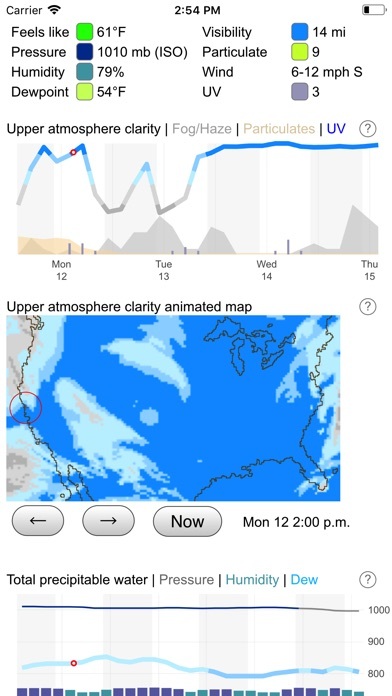 Our unique approach to weather data analysis and visual presentation will give you a better picture of what is going on in the skies. I am just a computer geek who has a passion for beautiful weather. I was not satisfied with anything out there, so I studied meteorology and experimented with data analysis code I wrote until I got something that matched what I saw. I spent two years collecting observational data and one year of tweaking and refining the data analysis to provide Nice Weather Days™. I use Nice Weather Days several times a day and I wanted to share it with anyone who would like to benefit from my work. 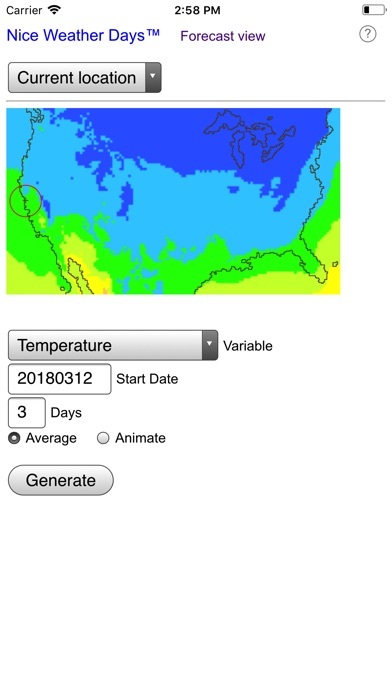 I created Nice Weather Days™ to show me things that no other weather forecasts provide. One thing I appreciate about our beautiful Earth is a pristine blue sky. I want to identify what days will have that "sapphire glow." However, most weather sites will just say "sunny" and not take into account faint clouds and hazy skies. Another shortcoming of weather forecasts is they do not differentiate between the types of clouds on the forecast. I particularly appreciate beautiful cotton-puffy cumulus clouds and despise hazy, milky, soupy stratiform clouds that look listless. 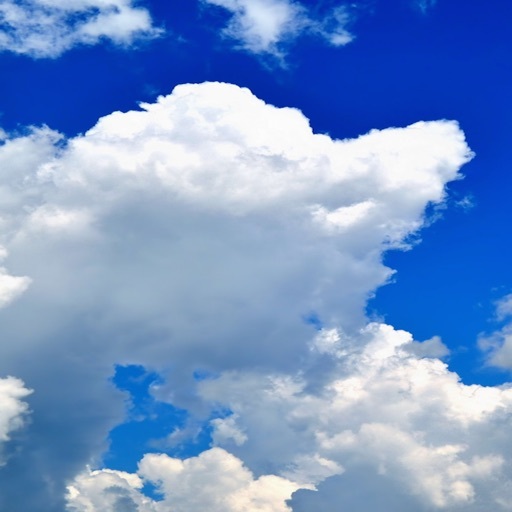 A forecast will say "partly cloudy" but what does that really mean? If the forecast says it will be 78 degrees, that sounds perfect, right? Not if you have ever been in the southeast where humidity creates that stifling, muggy feeling. If the dewpoint is 73 on that 78 degree day, you are going to be sweating bullets and feel completely lethargic. 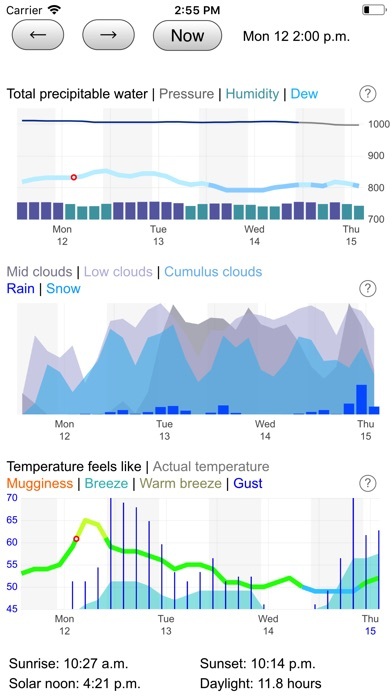 Nice Weather Days™ takes the humidity into account and color codes the temperature so you can see quickly how you would feel throughout the day. When the weather gets cold, the wind chill is also taken into account.